James Whitehead co-founded the UA Creative Writing program in 1965 and helped bring it to national prominence. He taught literary luminaries Barry Hannah, Ellen Gilchrist and C.D. Wright, among others, and made his own contributions to literature through four books of poetry and a critically acclaimed novel, “Joiner.” He died August 15. 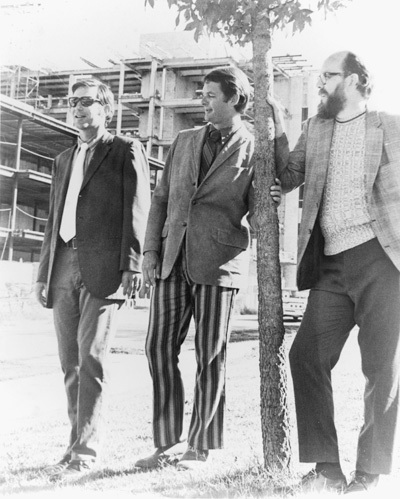 Whitehead is pictured here with William Harrison, center, Miller Williams, right, and behind them, the construction of Kimpel Hall. Image used Courtesy of University of Arkansas Special Collections, Fayetteville, AR. So quickens my spirits I think I’ll cry. She’ll show up driving the Ambassador. Well, I’ll light up and smile to see her coming. And if you think this end is dreams, you’re wrong. With brains and luck all things are possible.